Scientists returned to the Vailulu’u underwater volcano that lies approximately 20 miles east of Ta'u Island in American Samoa. View a slide show of marine life collected by scientists diving in the Pisces V submersible. See the new volcanic cone, discovered in 2005 and named Nafanua for the Samoan goddess of war. Click image to view a slide show. Scientists participating in the second cruise. Left to right: Adele Pile (U. of Sydney), Stan Hart (WHOI), Ray Lee (Washington State U. ), Craig Young (U. of Oregon), Lisa Sudek (Scripps), Hubert Staudigel (Scripps), Terry Kerby (U. Hawaii), Sandra Brooke (U. Oregon), Brad Bailey (Scripps), Brad Tebo (Scripps) Click image for larger view and image credit. Vailulu'u is an underwater volcano that lies approximately 20 miles east of Ta'u Island in American Samoa. Although this volcano will probably become the next Samoan island at some time in the future, its existence was only suspected until 1999 when it was first mapped using remote sonar methods. At that time, this massive volcano rose from a depth of 5000m to peak in a symmetrical cone about 600m deep. The bottom of the caldera, at a depth of about 1000m, was more-or-less flat when the volcano was last visited in March 2001. 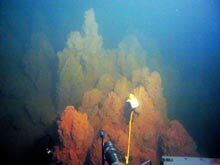 Just before our first submersible dive in March 2005, a quick multi-beam survey revealed the presence of a new submarine volcanic cone that had erupted from the floor of the caldera during the past four years. This new cone, named Nafanua for the Samoan goddess of war, now forms a new central summit with a depth of 708m well above the two major breaches in the crater wall. Continued growth could bring the summit close to the sea surface within decades, even though there is currently no evidence of active lava flows. 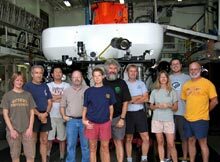 Exploration of the volcanoes was done by submersible several times on two cruises during March and July of 2005. The Pisces V, a human-occupied submersible, made nine dives during the two cruises, collecting samples and taking measurements of the surrounding environment with a variety of equipment. The scientists inside the submersible recorded their observations during these dives, while the onboard camera gathered hours of deep-sea video. On each cruise, dives to the volcano revealed yellowish microbial mats draped over crumbly pillow lavas. Warm water, emanating from between the pillows elevated the temperature by only a few degrees. Remarkably, the crevices at this site are occupied by thriving aggregations of cutthroat (synaphobranchid) eels that swarm in the water column when the submersible touches the sea floor. These eels, which have now been identified as Dysommina rugosa, are known from trawl samples in both the Atlantic and Pacific oceans, but have never before been studied in their natural habitat. 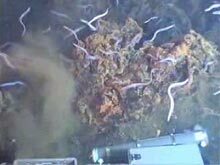 Although they were the only common metazoan (multicellular) animals occupying these low-temperature hydrothermal vents, preliminary work indicates that they use the vent only as a place to live. They seem to feed not on chemosynthetic bacteria, but on crustaceans that pass by Nafanua's summit in the currents. Swarms of small synaphobranchid eels, Dysommina rugosa, live in the crevices on the summit of Nafanua. Scientists dubbed this site "Eel City." Click image for larger view and image credit. Currents, water flow and the movement of hydrothermal fluids inside and around the crater were monitored using a fluorescent dye release, and current meters deployed on the peaks and breaches of Vailulu'u. The submersible deployed the dye near the main crater floor hydrothermal vent field, enabling scientists inside to monitor the dispersal and flushing of the dyed fluid over 10-days on site. Oceanographic sampling of the water column was also conducted on separate cruises using over-the-side CTD equipment. Understanding fluid movement around the volcano offers unique insights into thermal and chemical fluxes, nearby biological communities, and processes that couple the hydrothermal system with the ocean. Chimneys inside the southern wall of Vailulu’u. Click image for larger view and image credit. Hydrothermal fluids and particulates accumulating in the Vailulu'u crater are released to the open ocean through a complex crater ventilation process. Buoyant hydrothermal plumes rise only to the height of the summit because of a steep density gradient in the water column at that depth. Clear oceanic water is driven through the NW and SW breaches by currents and tides. As this water sinks into the deep moat surrounding Nafanua, it displaces the turbid hydrothermal waters, forcing them to billow upward. Crater waters are mostly expelled through the SE breach, but other sections of the crater wall are probably involved as well, especially at low tides, when the hydrothermal plume collapses and forms a cloudy ring around Vailulu'u summit. The distribution of hydrothermal fluids in the crater and the flow of water around the volcano creates several distinct habitats with distinct biological communities. 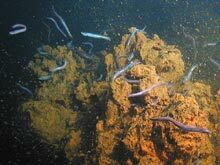 The outer flanks of the volcano support hard-bottom epifauna (animals living on or associated with the seafloor) dominated by octocorals, sponges and occasional echinoderms. This community is richest near the peak of the volcano, where fast currents provide the best flow and feeding conditions. On the inside edges of the Southern breaches, where clean seawater spills into the volcano, there is a dense population of small stalked sponges, yet to be identified. These sponges serve as an excellent indicator of chemical conditions, as they do not occur in the turbid waters where hydrothermal fluids from the volcano billow upward near the crater walls. These relatively lush communities on the summit of Vailulu'u contrast markedly with the region, dubbed the "Moat of Death," that surrounds the base of Nafanua on the crater floor. Here, where the waters are turbid and acidic, the sea floor is littered with the carcasses of fish, squids and crustaceans. The only living animals found in this zone were bright red polychaetes (marine bristle worms) that swarmed around the rotten fish carcasses, where they may consume bacteria. Multi-beam maps showing the Vailulu'u crater when it was mapped in 1999, and again in 2005 when the map revealed a new volcanic cone, named Nafanua for the Samoan goddess of war. Continued growth could bring the summit close to the sea surface within decades. Vailulu'u and Nafanua produce substantial quantities of hydrothermal fluids and particulates that decrease visibility inside most of the crater and locally cause near-bottom water pH to fall as low as 5.1. The sources of hydrothermal particulates are not clearly understood, even though submersible observations identified three distinct hydrothermal vent complexes inside the crater. Low-temperature vents at the summit of Nafanua are one of three distinct vent complexes located in an array that coincides with the epicenters of recently recorded volcano-tectonic earthquakes. The hottest vents (up to 85°C) were found at the foot of the northern crater wall, where they formed a zone of venting in several fields. Low salinities in the hydrothermal fluids suggest they form as steam in a boiling reaction zone that then condenses, mixes with other waters, and vents. These fields also release substantial quantities of an oil-like liquid, most likely CO2, that probably contributes to the acid waters in this region of the crater. Nafanua summit vents may be fed from a weak, deep rooted hydrothermal source or represent the final cooling stages of this new volcano. Another type of low temperature vent (ambient to about 28°C) produces Iron Oxide chimneys. The largest field of these is located on the inner South crater wall. Both kinds of low-temperature hydrothermal vents were also found on the west rift of Vailulu'u, outside the crater and down to a depth of at least 1700m. 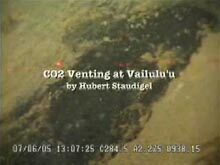 Overall, Vailulu'u has a very dynamic and robust hydrothermal system that was estimated to release the heat equivalent of 20 black smokers from the East Pacific Rise (see Ring Of Fire 2002 Exploration). It is likely that the total heat output of the mid-ocean ridges is significantly larger than the total heat output of all seamounts, but the total intensity of venting at Vailulu'u shows that seamounts may be significant players in the heat budget of the solid earth as well. These systems certainly have a substantial impact on defining the local chemical marine environment and the development of some unique ecosystems like Eel City or the "Moat of Death." Vailulu'u and its hydrothermal vents offered an exciting opportunity to explore the complex interface between the lithosphere, hydrosphere and biosphere. These three spheres are linked through the circulation of seawater through volcanic - hydrothermal systems, and the complex couplings of these hydrothermal systems with the oceans. Above all, however, Vailulu'u demonstrated that ocean exploration is alive and well; there are still exciting mysteries to be discovered in the deep oceans, and many interesting scientific puzzles remain to be solved.